Home > Florence Peto patterns > "Florrie's Gardening Club"
My mission is to educate you about Florence Peto and to inspire you to be creative, not to clone the "Calico Garden Extraordinaire" quilt. There are 72 charming Posey Packets® in this historically based program, each numbered and each containing some history of Florence. 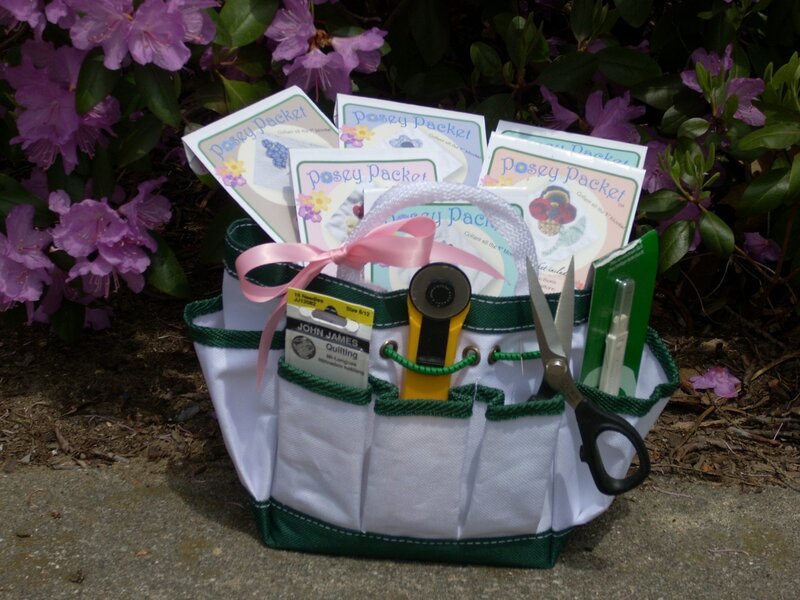 Upon joining, you receive a set of "Starter Seed" Posies (1-12), the adorable Gardening Tote to carry your "gardening tools", and a Coupon Book for Hoopla's website. In addition, a wonderful garden-themed (appliqué gardening, that is) binder is included. Click here, to read more about the Club and the privileges you receive for being a member! Come join the Club for discounts and free US shipping - and be one of Florrie's Gardeners! Wholesale Customers, email info@hooplapatterns.com for set up information and prices.